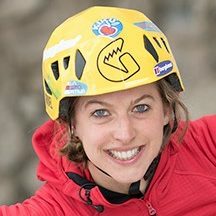 Ever since her first alpine fixed-rope route she was hooked, from there she took part in regional, national and international competitions and, after winning the Junior Italian Championships in Sport climbing several times she became three times Ice Climbing World Champion. But in the Winter Angelika does not only participate in World Cup competitions, but has also repeated some of the most difficult ice-, mixed- and Drytooling routes in the world. In November 2017 she climbed the Drytooling route ‘A line above the sky’ and became the first woman to climb a route graded D15. Angelika is crossing over the big pond thanks to our amazing sponsor Grivel.